When Tommy and Jason went on a quest to find weapons capable of destroying the super putties, they stumbled upon Titanus, who was guarding them. After getting the weapons, Zordon informed them that Titanus was an ally, and would lend a hand when needed. 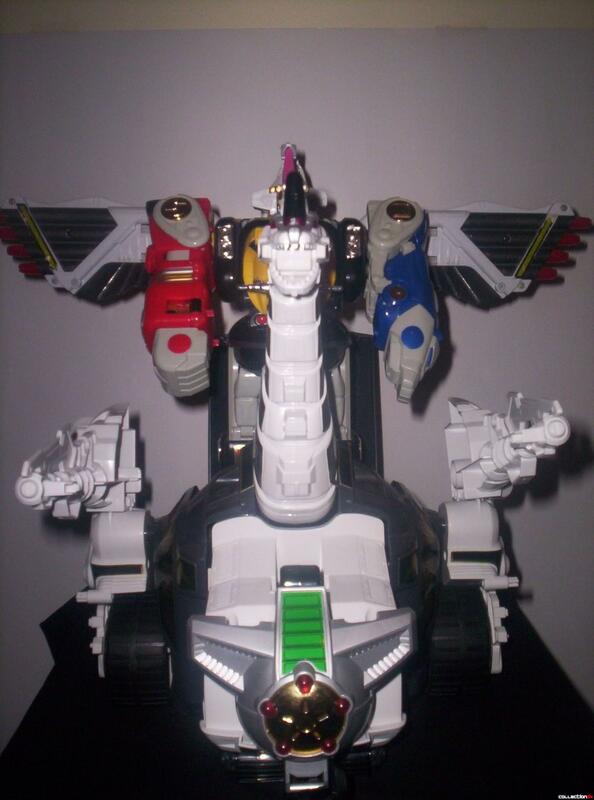 A few episodes later, Titanus combined with the (yet unnamed on screen) Megadragonzord and formed the Ultrazord, the mightiest zord in that season. 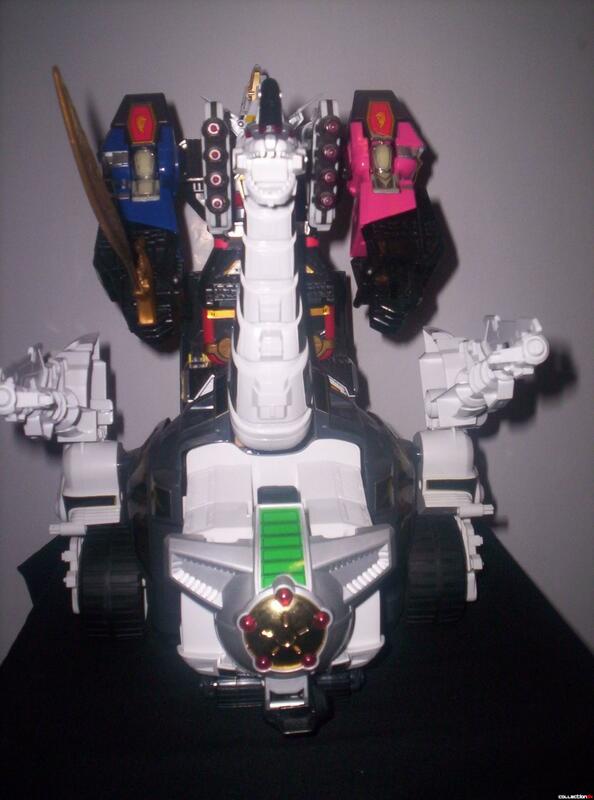 Titanus was forgotten when the Rangers powered up to the Thunderzord, but was re-activated and modified to combined with the Ninja and Shogun Megafalconzords to form a new Ultrazord. Now, let’s talk about the real thing. 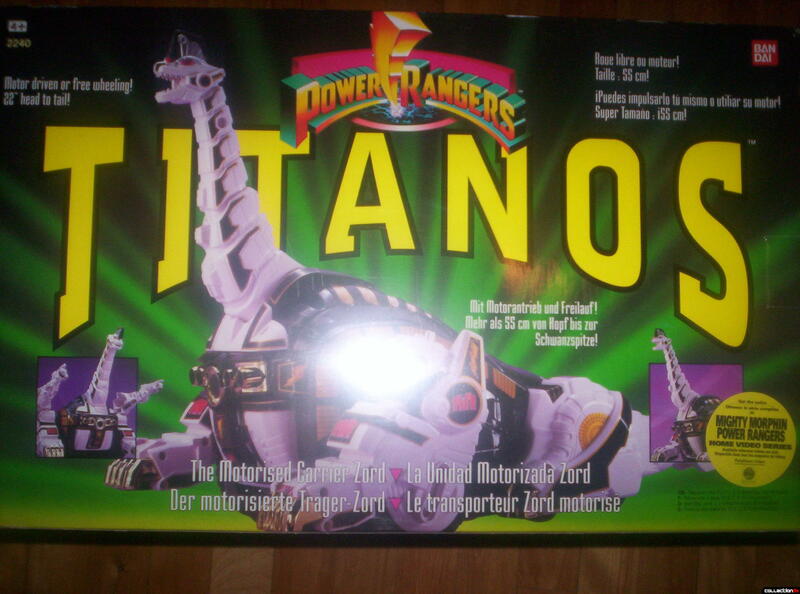 Titanus is a HUGE toy: 22 inches long, around 10 high. Even knowing the beast’s size, I was still surprise when I got it. Out of the box, Titanus is easy to assemble… safe for the FORTY or so stickers to place. You’ll never convince me that a 4 year-old kid can do it, but I digress. Even left alone, Titanus is a heck of an addition to a collection. The monster has two modes: “carrier mode” and “attack mode”. 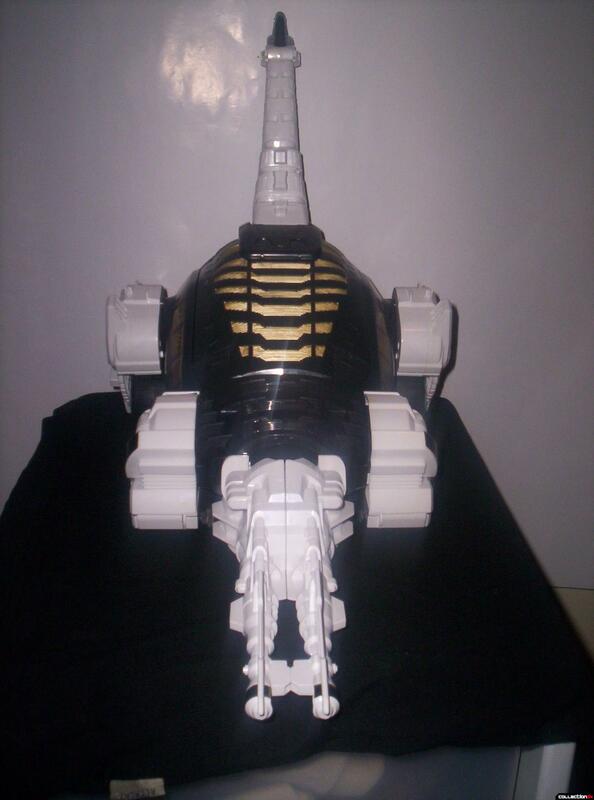 In “attack mode”, the tail becomes the cannon, the back opens up to reveal a compartment design to house a Megazord, and the chest comes out. And of course, it has a motor, meaning you can make it roll around and dribble while watching it. But the real fun starts when you combine it with the Original (sometimes called “mighty” or “Dino”) Megazord and the Dragonzord. Titanus was released three times. First during the MMPR season 1, Then MMPR season 3 (dubbed The Return of Titanus, including a non-functional version of the Dragonzord chest plate) and finally “Space Titanus”, during the PRiS arc (the poor thing got the head and pawns cut off, and a modified chest). 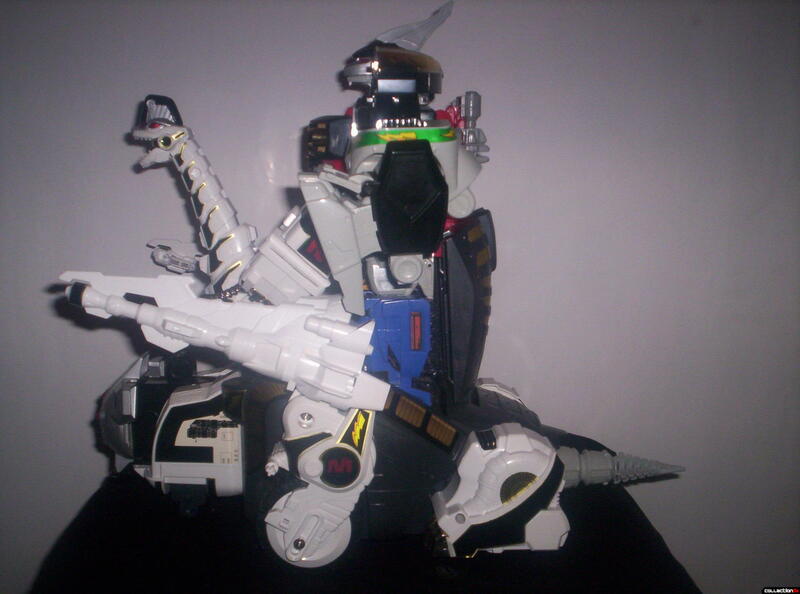 The Ultrazord is definitely something to be reckoned with. Huge, heavy and scary. 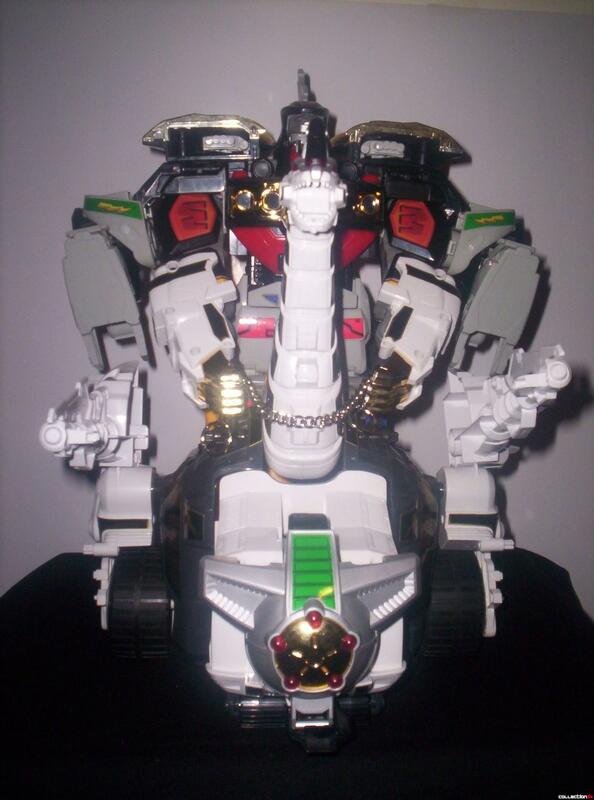 The Dragonzord’s tail and chest become Titanus Tail and “chest”. Titanus’ chest and pawns become chest pieces and gloves for the Megadragonzord. The chains are used as reins. Even if that combination is smaller than the next season Ultrazord, it has a little something making it more impressive. 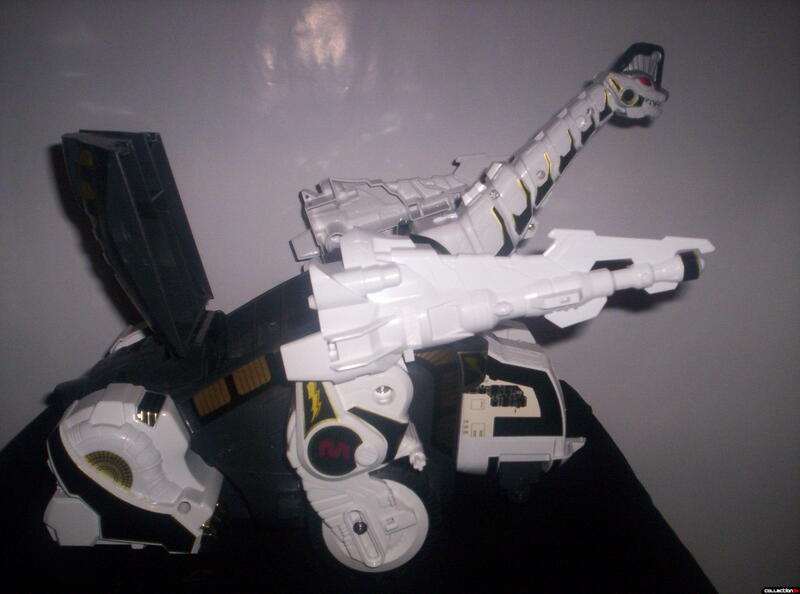 You can also use Titanus as a “carrier” (hope so, that’s its name “The CARRIER zord”) of sort, by connecting the chain to the harness, snap them under the Megazord “Tank mode”. When the motor is activated, he’ll move around like Titanus. Finally, you can combine Titanus with either the Shogun or Ninja Megafalconzord (or any megazord that is roughly the Original’s size), to form new ultrazord combinations. A re-release of Titanus, dubbed “Return of Titanus”, including the Dragonzord’s chest plate, have been specially made for that purpose (and to make some extra money). The only differences with his Japanese counterpart are found in the stickers, modified to fit the Power Rangers line (understand big Ms and lightning bolts…). Even the motor and Zyurangers logo have been left untouched. I highly recommend this zord if you are a fan of Super Sentai. A must have if you loved the Saban Era of Power Rangers. 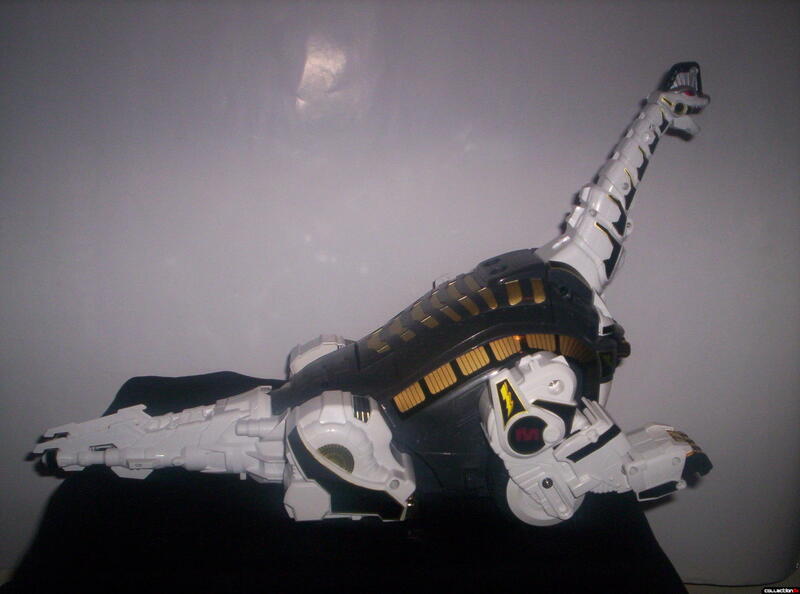 You don’t know what a real Ultrazord is until you have seen this one. There is something that I have always wondered. Did Titanus (King Brachion in Japan)come back in the Sentai series as well or just in America? Oh, that's easy. If you look at all the footage of the Ninja and Shogun Ultrazords- including when they're combining- it's just the toys with a little detail painting added to them like smudges and blast marks. and the dead give-away- the God Kark & White Kark had no pink on either one of them... which the toy versions of the Pink Shogunzord and Crane Ninjazord did. It's a little trickier to tell with the Deluxe Ninja Megazord since it almost perfectly matches the DX Kakure Dai Shougun, but just look at the knee decals; the materials for the Ape Ninjazord's swords are also different from the God Saruder's. Having said all that, there is rarely a time- other than a special direct-to-video one-shot crossover- where series meet. "ZyuRanger" and "KakuRanger" never mixed except in the dream team sequence in "GaoRanger VS. Super Sentai" (2001) which celebrates the saga's 25th Anniversary. And even then, only the Red Rangers appeared; all other members of the teams appear in flashbacks throughout the movie. This particular system of mecha is one of my stand-out favorites since PR first began back in '93. 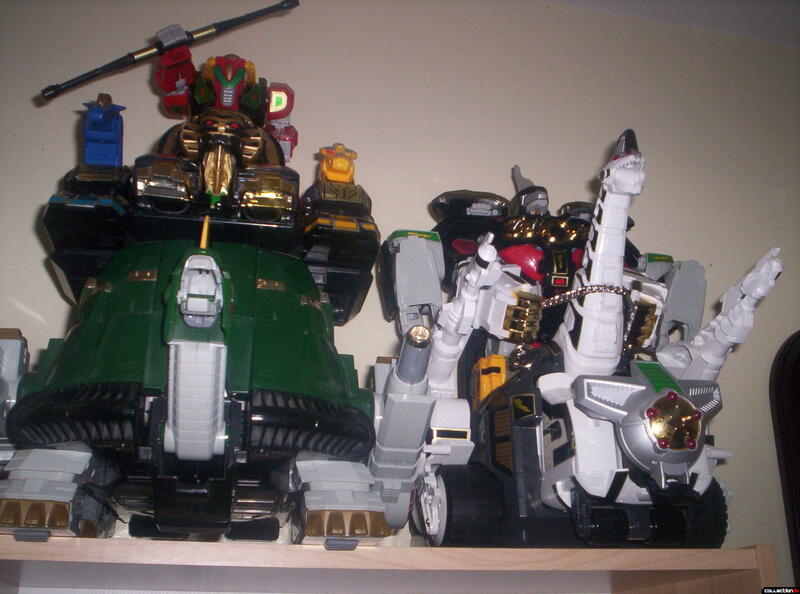 I remember having dreams about getting the Deluxe Megazord, Dragonzord and Titanus! 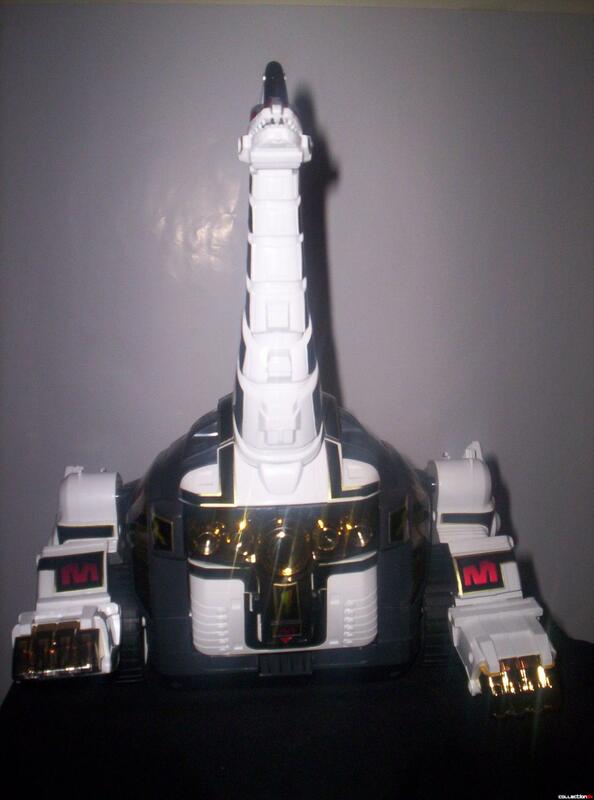 What sucked was having to get my sister's permission to borrow her Titanus each time I wanted to make the Ultrazord... which she eventually sold to me (together with Tor The Shuttle Zord) for, like $50-or-something. That recently, no combo was made possible in the US/Europe! Since most of the zords don't get release here (like some auxiliary zords in Dino Thunder or Mystic Force) or so heavily modified that they just don't look good at all (yeah, I’m talking about Operation Overdrive...). And it looks like the same thing is going to happen this season. "Awww man, that’s one ugly zord..." - Tommy, about Serpentera. On a separate note, Chris, when I first started shooting my own pictures for reviews, I used the flash a lot too. Other than draining the batteries real quick-like, I found out that reflected flash effects tend to blur out and obscure details. So I switched to only doing it for dramatic shots only where details weren't needed as much. (I almost never use it now.) I also use my overhead lights and open the blinds on my windows to help out, in addition to shooting in an open area against at least one light- and neutral-colored wall.